Allow them to bake for about 30 minutes, until the skin gets crispy and the inside is soft. Once the eggplants have cooked, slice them lengthwise and scrape the inside part. You may discard the peel or save it. Place the eggplant “meat” in your food processor with all the remaining ingredients and blend until smooth and creamy. 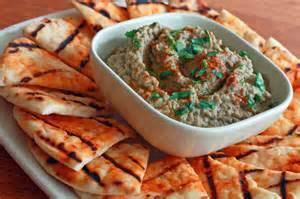 Serve with homemade Pita Chips!